Early-bird registration is now open for the NCTM 2018 Annual Meeting & Exposition, April 25–28in Washington, D.C. You have attended in the past, but next year's conference boasts new content, new speakers, and both new and past attendees. You rely on NCTM as your guide year-round on pressing classroom needs with publications and tools for success. Join the best mathematical minds and the most dedicated educators and participate in the premier math education event of the year. "Being here has really allowed us to collaborate with other math teachers and get a lot of ideas, new ideas we can implement back in our district." "It's really great to hear from all the math rock stars, what they're putting into practice, and what the big ideas are that they have." "I think for new teachers, the NCTM Conference is a must." Discover more reasons to register for the 2018 Annual Meeting. Watch the video. Assessment, one of the 2018 Annual Meeting topics, focuses on purposeful planning and instruction. 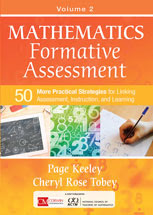 Outlined in the NCTM publication Mathematics Formative Assessment Volume 2, are 50 all-new formative assessment classroom techniques (FACTS) that are embedded throughout a cycle of instruction. This publication does not present a one-size fits all approach, but helps you build a bridge between your students' initial ideas and correct mathematical thinking. Formative assessment "describes all those processes by which teachers and learners use information about student achievement to make adjustments to the students' learning. It's using information to adapt your teaching and adapt the work of the students to put the learning back on track, to make sure the learning is proceeding in the right direction." Make your plans to attend again early, and be excited to again share experiences and gain insights with thousands of peers. Take advantage of discounted room rates and book your hotel room through NCTM's housing partner Wyndham Jade before March 31 and you'll be entered to win a free night. Learn more and reserve.